Valentine's Day is fast approaching, so we need to get all those cards done. I'm using another image from Doodle Pantry for this card. This is an older image, but still very very cool. There is still time for the HUGE SALE - 30% off new February releases and all Valentine sets. It is going on until February 8th. Also, don't forget to join Challenge #43 at Doodle Pantry's Blog. You have until February 24th to post your project. You can use any digital image you want to be eligible for the grand prize of a $15 gift certificate to the Doodle Pantry's store. However, in order to receive the Easter Peeps digital stamp set for free, you must use a Doodle Pantry image (not just a sentiment). Cute card, I love the ant image and your layout is fabulous. Thank you for playing along with the Crafty Boots Bingo Challenge. Very cute...love the glitter design! Love this card! Beautifully put together and so precious! what a super beautiful card Susan, love it. What a great Valentine's card and the image is so cute. Great design too. Thanks for sharing it with us for the Sparkle N Sprinkle Creative Challenge. What a fun card! Love the glitter too. This is gorgeous, Susan! I love the glittery wave revealing the hearts. Thanks so much for playing along with the Simon Says Stamp Wednesday Challenge: Have a Heart! What a gorgeous design for this adorable DP image. Great colors and sparkle! Wow - what an original and clever design, love it. 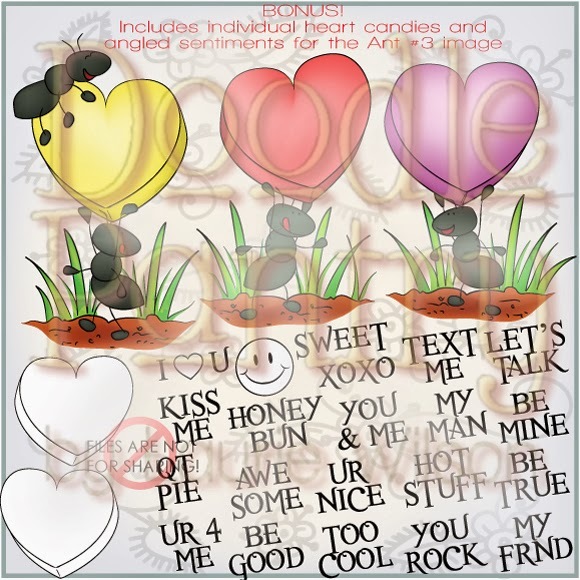 The ant image is soooo cute. Thanks for joining in at Crafty Boots Challenges this time. Cute card and image! Thanks for joining us at The Crazy Challenges. Super cute image, such a pretty card. Thanks so much for playing along with ASM this week! Adorable card such a sweet little image. Adore your design on this card, love the sparkle and everything else, a very wonderful card! Cute Valentine card thanks for joinig our colour challenge at Incy Wincy this week. Susan totally awesome card, I love all the glitter!! This is totally beautiful!! Wow! Love this card. All those cuts, colors and swirls, and glitter and non traditional colors...gorgeous! So pretty Susan! Thank you for joining us this week at Word Art Wednesday! Wonderful card! Your coloring is great. I must get back to Doodle Pantry! Hey Susan!! I'm here with my DS4J hat on :D LOVING the image and layout!! Love the little ant! Perfect accent for your card too. Great job and thanks for joining us at Creative Cutting Challenge this time. awesome card. Thank you for joining us in the challenge at Creative Cutting Challenges.